IBC is in full swing here in Amsterdam and the SVG Europe and SVG editorial teams are chasing down the hottest stories from all over the Rai convention centre. 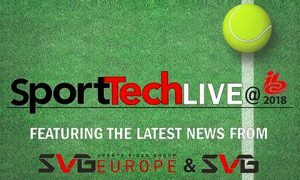 To make the onslaught of announcements easily digestible for our readers, SVG Europe is sending you a daily SportsTechBuzz at IBC 2018, with all the top stories gathered together in one easy to read blog from our newshounds. Today’s edition features Artel Video Systems, Axon Digital, Broadcast Solutions, Calrec Audio, ChyronHego, Clear-Com, Cloudian, EVS, FOR-A, Gearhouse Broadcast, Globecast, Grabyo, Grass Valley, Imagine Communications, Leader Electronics Corporation, Marquis Broadcast, Media Links, Mobile Viewpoint, MX1, Ncam Technologies, Nevion, Signiant, Slomo.tv, Sony, Telestream, Telos Alliance, TVU Producer. At IBC 2018 Media Links is showcasing its new solutions for delivering and receiving video, audio and data quality to and from the network edge on stand 1.C31. The MDP Series addresses the real need in the marketplace for compact and portable, tightly integrated, affordable and easy to use platforms that enable the transport and delivery of real time IP media services.said the company. The new MDP3040 IP Media Gateway is making its debut at IBC. FOR-A is demonstrating its vision, a gateway to IP, on its stand, as well as discussing overall technology highlights and an explanation of the company’s product strategy. Today it is also hosting an IBC Kick-Off Media Reception in its booth (2.A51) beginning at 9:30 am. Foremost in the discussion on Friday morning will be the combined benefits of 12G-SDI and IP-based technology. MX1 on stand 1.B51 is demonstrating new capabilities and workflow enhancements to its MX1 360 platform. MX1 360 is the company’s unified media platform for managing and delivering linear and nonlinear content to any broadcast, VOD, or OTT platform. This platform enables broadcasters and service providers to offer a full range of end-to-end services, as well as successfully aggregate, manage, and deliver linear and nonlinear content. TVU Producer (2.B28) will, according to the company, enable anyone to produce multi-camera video, eliminating the need for expensive hardware and software or prior training. Covering a wide range of applications, from live sports events and egame competitions, through to house of worship services and concerts, the simple web-browser interface of TVU Producer enables it to handle any multi-camera production from virtually any location. Ncam Technologies has announced the first European presentation of its portfolio of products and solutions that enhance the realism of augmented reality content. The company is also showing its newest version of Ncam Reality, its second generation camera tracking solution. New innovations on stand 7.D02 include Real Light, which gives virtual graphics a more realistic appearance. Imagine Communications (4.A01) is on hand to demonstrate practical innovation and migration strategies that enable media companies to personalise the path and pace of their transition to next generation architectures and business models. IBC attendees are invited to bring their technical, operational and business questions to Imagine experts who can share insight on key industry issues from how SMPTE ST 2110 actually works in the real world, to how value can be extracted from remnant advertising inventory, to when it makes sense to virtualise playout operations or transition content origination and distribution to a public cloud. ChyronHego (7.C21) is previewing CAMIO 4.5, the next release of the company’s graphic asset management solution, with key features designed to make producer-driven news workflows even more versatile, flexible, and cost effective. CAMIO 4.5 enhancements include a powerful new render engine, the ability to publish content straight from the newsroom to social media, and the latest version of LUCI5, the HTML5 plugin for fulfilment interface. Stop by the Cloudian booth (7.A43) to learn more about how to effectively tackle the challenge of storing all that unstructured data with infinitely scalable, on-premises object storage. Talk about areas such as disk-based active archive and infinite scalability without disruption. Marquis Broadcast is showcasing its disaster recovery and business continuity tools (7.D39), including the new Fotonflite secure transfer system. The company is also demonstrating its Interplay Metadata Export Tool (IMET) in Europe for the first time, which enables customers to take an Avid Interplay project and media metadata and export it, along with developments in its Project Parking, Medway and Edit Bridge solutions. Partnering with eSport company ESL, the EVS stand (8.A96) is a playground for live eSports competition, featuring two ESL One championship players competing in a game of Counter Strike: Global Offensive (CS:GO). Around them, demonstrations are showing how ESL uses EVS technology for live switching, live replays and fast turnaround content production to output engaging live content to multiple online platforms. Gearhouse Broadcast has announced it has partnered with Spidercam to bring its new SC-Light solution to IBC 2018. Located on the Gearhouse stand (10.B39), the suspended camera system designed to work in smaller venues like TV studios or indoor sports arenas is in action throughout the show. This is part of Gearhouse’s continued commitment to working with the latest production technologies, in order to deliver maximum value to its customers. Clear-Com (10. D29) is highlighting the high density audio-and-intercom-over-IP connection card for the Eclipse HX digital matrix intercom family, called E-IPA. Natively AES67 compliant and SMPTE2110-30 ready, the E-IPA card provides 64 streams of low latency and high audio bandwidth connections for linking existing and new IP-based Clear-Com products, including the new FSII IP transceiver (IPT) and is ready for interoperating with other AES-67 compatible Clear-Com products. The E-IPA IP Connection Card is making its European debut at IBC 2018. Axon Digital has announced the latest release of its Cerebrum control and monitoring platform, which provides the comprehensive third party device control. New protocols featured include support for Audinate Dante, Ross Ultrix, Harmonic, Wohler, Vislink and Blackmagic. On stand 10.A21, Axon is demonstrating why this control and monitoring platform is useful for mobile production, news and studio live production, master control and remote production. Meanwhile Slomo.tv (8.B40) is showcasing a new integrated content creation and capture solution that combines its Simple RII server and what is billed as the world’s smallest true HD camera: Lux Media Plan’s HD1200. This production solution integrates slomotv’s 1U compact 8-channel Simple RII replay server with Lux Media Plan’s HD1200 mini-camera. LMP’s camera shoots 120fps progressive Full HD. It provides high performance 50% speed slow motion video and meets all the requirements of a modern progressive Full HD video world. Grass Valley is showcasing its newly enhanced product portfolio at IBC 2018, using the best innovation and expertise to give customers the ultimate selection and service. Visitors to the Grass Valley booth (9.A01) can see how this extensive portfolio delivers real world solutions to the challenges that broadcasters are facing, and how the acquisition of SAM earlier in the year provides additional value for Grass Valley customers. Broadcast Solutions has taken two stands at IBC 2018, including the show’s largest outdoor display space. Focusing on systems integration, the outdoor stand (O.E02) is accompanied by an indoor stand (8.D74) where Broadcast Solutions is presenting its answer to today’s and future challenges in managing media infrastructures. Based on more than 20 years’ experience in system design Broadcast Solutions has developed hi, an intuitive and easy to use control layer for media appliances. Calrec Audio has revealed two new IP products on stand 8.C61, the H2-IP Gateway and the AoIP Modular I/O controller card. Both products are SMPTE 2110/AES67-compatible and expand the range of AoIP solutions Calrec now offers. These two new solutions build on Calrec’s new Impulse core, a native-IP core for use with Apollo and Artemis surfaces. The H2-IP Gateway provides an interface between a Hydra2 network and an AoIP network. It also awards an extra control level that allows audio labels to be passed in both directions between the two networks along with control data. Leader Electronics Corporation is expanding its ZEN series of test and measurement instruments with the LV5350 portable 12G/3G/HD/SD-SDI waveform monitor and its LV7300 rasterising equivalent. Making its European exhibition debut on stand 11.B27, both products continue Leader’s heritage of providing products that support operational and engineering requirements within a single instrument. Grabyo (14.D22) is introducing its enhanced video editing platform, Grabyo Editor, a set of browser-based editing tools for creating and distributing short video clips, highlights and social video from live streams, VOD and mobile sources. The new service combines the speed and flexibility of Grabyo’s cloud-based platform with simple, effective tools for video editors. Accessed using a web browser, Grabyo Editor reduces the time it takes to produce high quality video content by enabling users to produce short clips and longer-form videos with multiple video inputs, graphics, imagery and audio. Sony has returned to IBC 2018 to present its latest solutions that help customers build their brands and audiences under the banner of ‘Go Make Tomorrow’. On stand 13.A10 Sony is showcasing its fully integrated, end-to-end services and technologies that empower media companies to create more amazing content and more engaged audiences, more profitably. “We are returning to IBC with firm drive and motivation to help [visitors] realise the commercial and creative potential of their content in the post digital age,” said Stuart Almond, head of marketing, Sony Professional Solutions Europe. Mobile Viewpoint (14.F24) has announced the European launch of two new products, NewsPilot and IQ Sports Producer, using AI to automate the low cost delivery of content from remote locations. NewsPilot and IQ Sports Producer enable smaller broadcasters and brand owners to reduce cost and complexity of live content production and delivery. Consistent with Mobile Viewpoint’s full solution portfolio, NewsPilot and IQ Sports Producer meet broadcasters’ requirements for fast, simple and cost efficient content contribution as they adapt their strategies to meet the rapid rise in online content consumption. Signiant is demonstrating advancements across its entire product line at IBC 2018 on stand 14.B23. The company’s broadly-adopted SaaS platform, which combines Signiant’s patented network optimisation technology with a feature-rich global control framework for the exchange of media, can be readily adapted to support emerging industry standards and practices. Here in Amsterdam, Signiant has introduced a new ‘IMF Aware’ interface and is demonstrating best practices for cloud ingest portals. The Telos Alliance is participating in the IP Showcase, where it is demonstrating AES67 interoperability using the Axia RAQ AoIP Console, Axia QOR.32 Integrated Console Engine, and Telos Alliance xNode Audio Interfaces. The IP Showcase is taking place in Rooms E106 and E107. “With gear from 50 manufacturers interconnected with AES67, broadcasters and creators of media content can see how AoIP is ready for daily use in their facilities. Come see that AoIP interoperability is not a science experiment. It is real and practical to implement today,” said Marty Sacks, VP of sales, support and marketing for the Telos Alliance. IBC 2018 is also shining a spotlight on the growing world of eSports and the opportunities and challenges that it presents, looking at everything from media rights and sustainable commercial models to the technologies and services needed to support the rapid growth. Visitors have the opportunity to take part in the IBC eSports Racing challenge on stand B03 in the Outdoor Exhibition area, complete with a full ‘Project Cars 2’ simulator, allowing visitors, delegates and exhibitors to test their skills and compete for special prizes over the week. IBC is also hosting a number of focused activities around the show.